There’s no interior seating, but there is dining in the covered breezeway, where there are four picnic-style benches and a counter with seating for 10. And of course they have takeout. I had lunch there on a hot day back in February and returned this week for a second meal and more photos. The first time, I had three tacos ($1.49 each, bottom): carnitas, al pastor and cube, a mixture of chicken and chorizo. 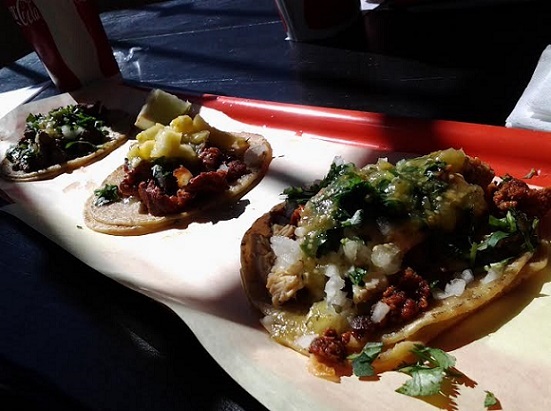 Really good street taco-style tacos, with the pineapple atop the al pastor a welcome touch. It didn’t surprise me to learn that owner Israel Miranda is a native of Mexico City as those are the type of tacos I had on my visit there in 2011. 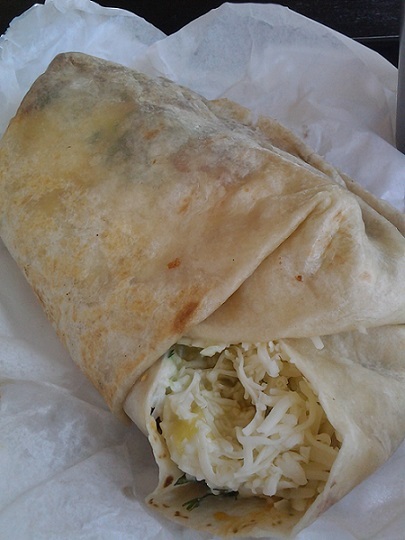 This week I tried an al pastor burrito ($6.50, middle), which also has the pineapple, as well as finely shredded cabbage (the effect was like slaw) as well as onions, beans, cilantro, sour cream and salsa. A little different, but tasty, and also large and filling. They also have a double burrito named The Big Donk, plus quesadillas and a couple of healthier options, a protein bowl and low-carb tacos. They have vegetarian and vegan options too not reflected on the menu. Its website has the restaurant’s menu, story and more. Alas, the former Tastee Freez doesn’t have ice cream cones. 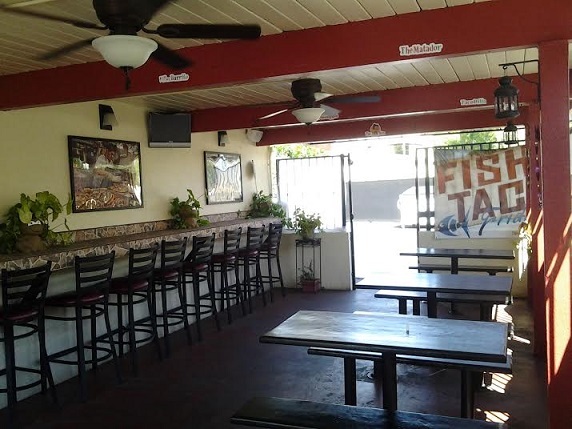 This entry was posted in Restaurants: Montclair and tagged Mexican, Montclair, restaurants by David Allen. Bookmark the permalink. Isn’t the site of El Pavo? I went there from 1985 until the late 90’s when I would go to the range at CIM and drive all them miles home with dinner for the family. Possible, but I don’t know. 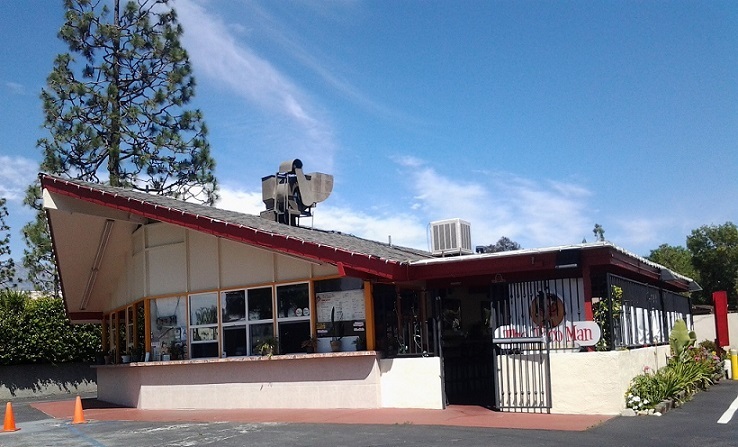 The old Tastee Freeze at Mission & Towne in Pomona just changed hands, too, but I drove by too fast to notice who was now there or if it was empty. And what’s with a native of Mexico using sour cream? I guess it’s cheaper than creme fresh but not on my order! I will be definitely stopping in this week. “Hold the sour cream.” I hear ya. Let us know what you think after you visit.